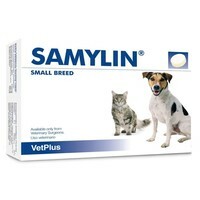 Samylin Liver Supplement is a nutritional supplement used to promote optimal liver health for cats and dogs suffering from liver disorders. Made with a unique complex of antioxidants that work synergistically to provide the best possible protection for your pet’s liver, the supplement helps to maintain healthy liver functions such as clearing out potentially harmful free radicals and pathogens. S-adenosyl L-methionine (SAMe): The active form and is integral to correct hepatic function. It is enteric coated in Samylin to ensure stability and bioavailability.